After being succeeded in office by William Howard Taft, the former president Theodore Roosevelt set out for Africa to hunt big game and collect specimens for the Smithsonian Institution. Known to history as the Smithsonian-Roosevelt African Expedition, the party began their journey 105 years ago this month and included Roosevelt’s son Kermit who served as official photographer, three representatives from the Smithsonian (a retired Army surgeon and field naturalist, and two zoologists), two famous big-game hunters, a wildlife photographer and filmmaker, and several hundred porters and guides. They collected 1,100 specimens, 500 of which were big game; Teddy and Kermit personally collected 17 lions, 11 elephants, and 20 rhinoceros. Roosevelt’s travels were memorialized in several ways from the silent film Roosevelt in Africa to Scribner’s Magazine’s articles that were later gathered together and published as a book, African Game Tails, in 1909. 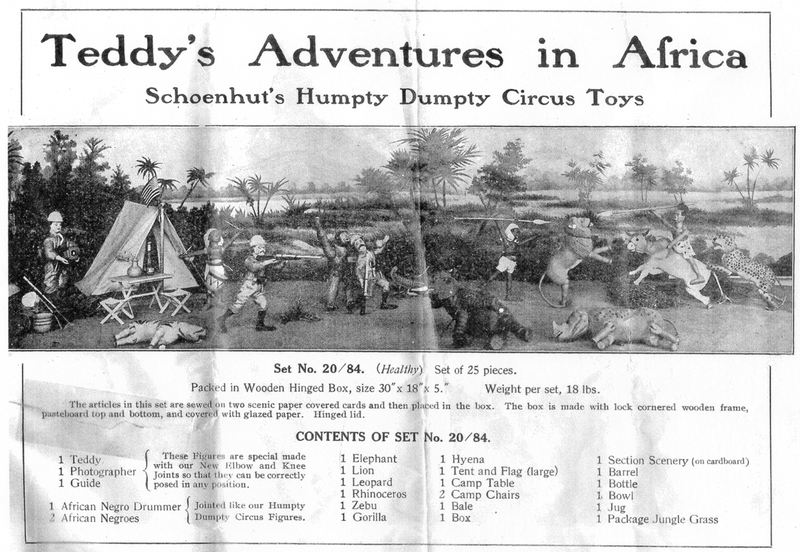 That same year, Schoenhut Company introduced their tribute to the expedition: Teddy Roosevelt’s Adventures in Africa Playset. Produced until 1912, the set included a doctor, naturalist, taxidermist, and native guides. Some of the playset parts were repurposed from the popular Humpty Dumpy Circus Playset, but the rhinos, zebras, hyenas, gazelles, deer, and gorillas were introduced for the first time. Bet you can’t guess which one is Teddy Roosevelt (hint: he’s carrying a rifle instead of a big stick)! We’re going to take a break from Schoenhut’s playsets to take a look at another extension of the toymaker’s offerings: an unbreakable all-wood doll. 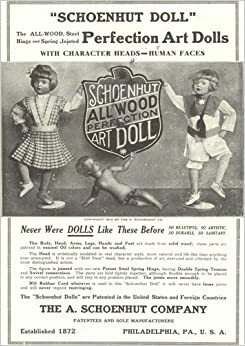 The jointed Schoenhut All-Wood Perfection Art Doll was advertised in a 1911 catalogue with a “new patent steel spring hinge, having double spring tension and swivel connection.” This meant the doll could pose in many human-like positions. Holes in the bottom of the doll’s feet allowed them to pose flat-footed or on tip toe with a special doll stand. While wood might not seem all that loveable, Schoenhut’s process of carving and burning away the rough wood left the surface as smooth as glass. The dolls were modeled after real children and painted with enamel oil colors so they could be washed easily after a messy tea party. The first dolls were 16 inches and came either dressed or undressed in modern children’s styles for $2 to $5. T/m’s Schoenhut doll Daisy was donated to the museum by her original owner Dorothy who received her as a Christmas gift. Daisy, who was named after Dorothy’s mother, went on many adventures before coming to us! In the late 1800s, Albert Schoenhut expanded his company’s production exclusively from toy pianos to include other musical instruments, soldiers, dolls, and boats. In 1903 he added a wooden toy set known as the “Humpty Dumpty Circus.” The circus, named after a popular 19th century play by George Washington Lafayette Fox, became the company’s most popular product. The circus initially included Humpty Dumpty the clown, and a barrel, chair, and ladder. Later, Schoenhut added circus performers, a ringmaster, acrobats, a lion tamer, and several animals to encourage sales. Humpty Dumpty, the performers, and animals were fully jointed with elastic cord allowing children to position their heads and limbs. The circus, ranging in price from 50 cents to six dollars, was a hit nationally and internationally with exports to Europe, Australia, and South Africa. Believed to be one of the first play sets developed in the United States, Schoenhut followed up with others, including this alligator. Stay tuned to see its set: Teddy Roosevelt’s Adventures in Africa! Many of the toys unwrapped this holiday season are made out of plastic, battery operated, or contain some sort of glowing screen. This obviously wasn’t always the case—some of the earliest American toy companies’ playthings consisted of simple, painted wood. 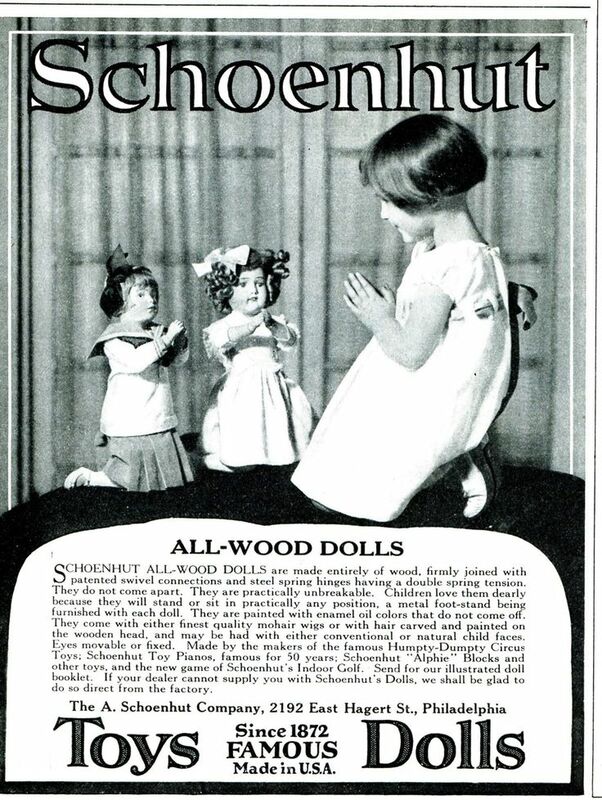 The first major American company to break into the German-dominated toy-making industry was the Schoenhut Company. The Philadelphia company was founded in 1872 by Albert Schoenhut, a German immigrant who came from a long line of toymakers. Although his father and grandfather focused on making wooden rocking horses, wagons, and dolls, Schoenhut branched out into toy pianos. By 1912, with an extensive line of toys, Schoenhut Company was America’s largest toy company and the first to begin exporting toys to Germany. The Schoenhut Company still exists today, although they now exclusively make toy musical instruments, including toy pianos. Albert Schoenhut’s legacy is not only an important part of American history, but also continues to influence musicians today.